Retirement is an occasion which compulsorily requires a letter to the employer or the superior authority to convey the message of your departure. Since the retirement letter goes to the superior most authorities, it is necessary to have the right structure. Sample retirement letters can help you find the right format and language for writing your retirement letter. The below – mentioned Sample Letters are some examples for aiding you to draft the correct letter for your retirement. A sample retirement letter for the announcement of your retirement is written in 2-3 sections. It conveys your experience with the Institute at your post and communicates your decision to retire from the same. 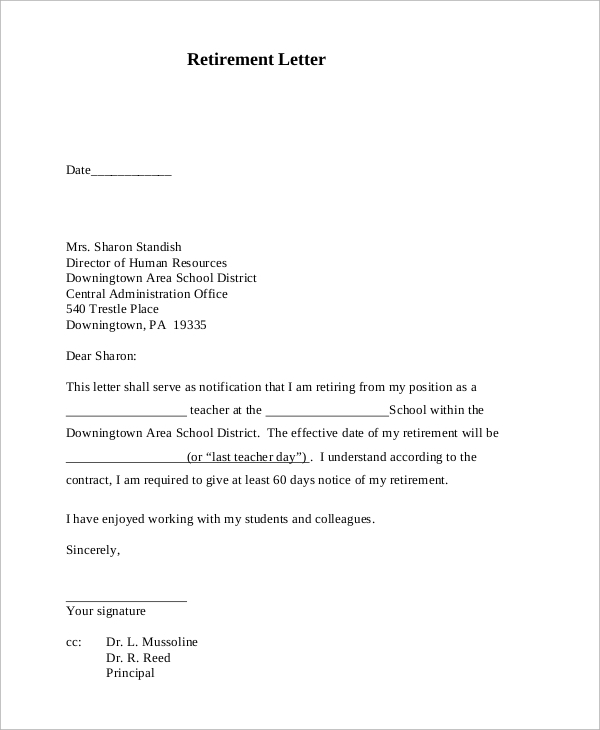 It is an example of a resignation letter. 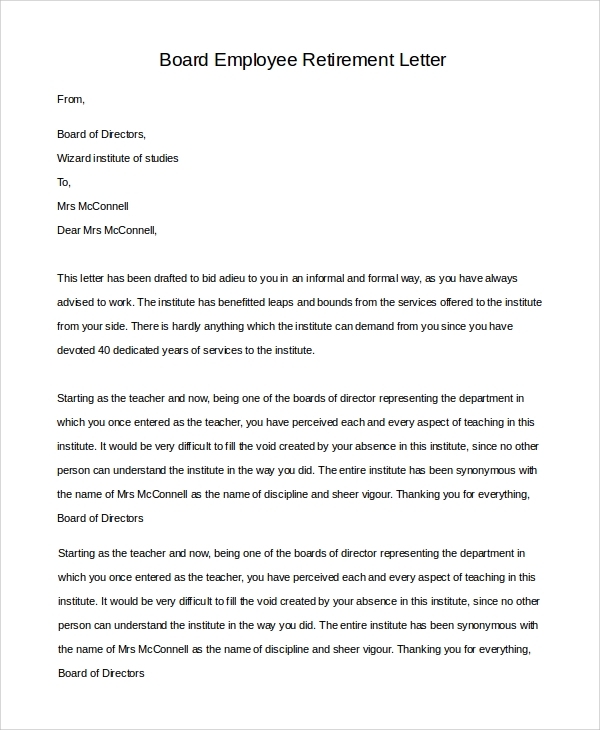 When a member of the board of any institute retires, the Sample Best Letters of Resignation is addressed to the fellow board members. 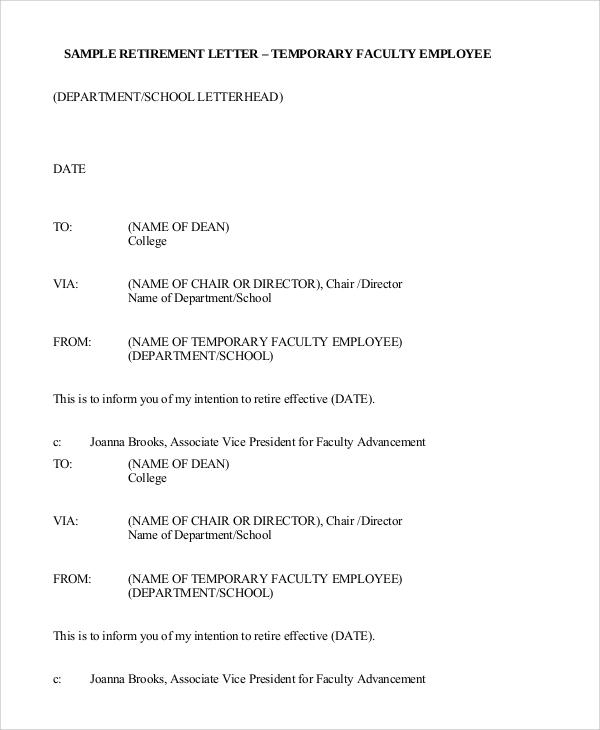 The letter puts across your decision to retire and also expresses your work times spent with the institution. The letter of retirement is required a month before the official retirement. 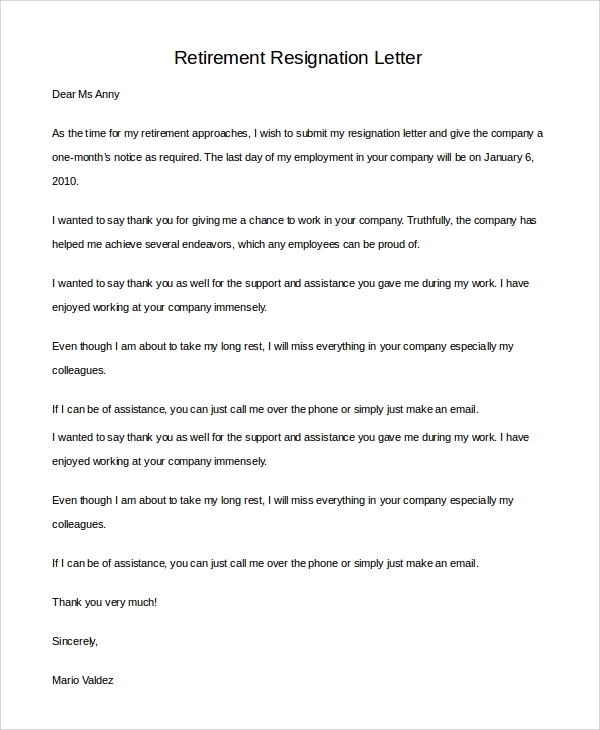 This sample retirement letter consists of the news about your leaving and the date and day from which you wish to discontinue. It expresses a request to the employer to grant their approval for the same. What are the usages of these Letters? Everyone is looking for a job today. There comes a time in each of our lives when we retire from our jobs. That is the time which calls for a letter stating the decision to leave. Sample Useful Retirement Letters are meant to help you understand the right format and find the right words to communicate this big decision to the higher authorities. They are useful to convey the retirement decisions of the employee to the employer. Since retirement requires many documents to be arranged for the retiring person, these letters also help the employer to prepare these documents on time. They are the examples of resignation letters and are useful for expressing your intent to leave not just the current job but work on a whole. A temporary retirement is when you are deciding to take a break for a year or two from your job. 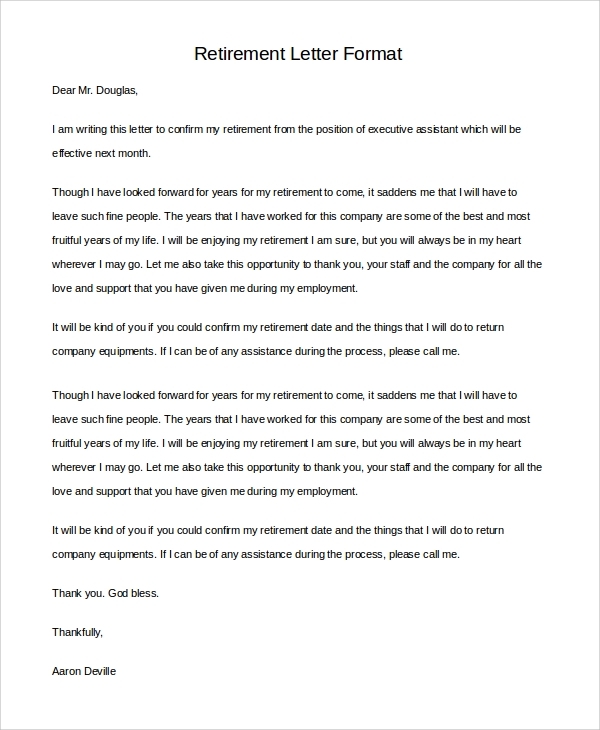 This sample retirement letter is also written in the same format as the others. It calls for a temporary departure from the firm stating the permissible reason for the same. 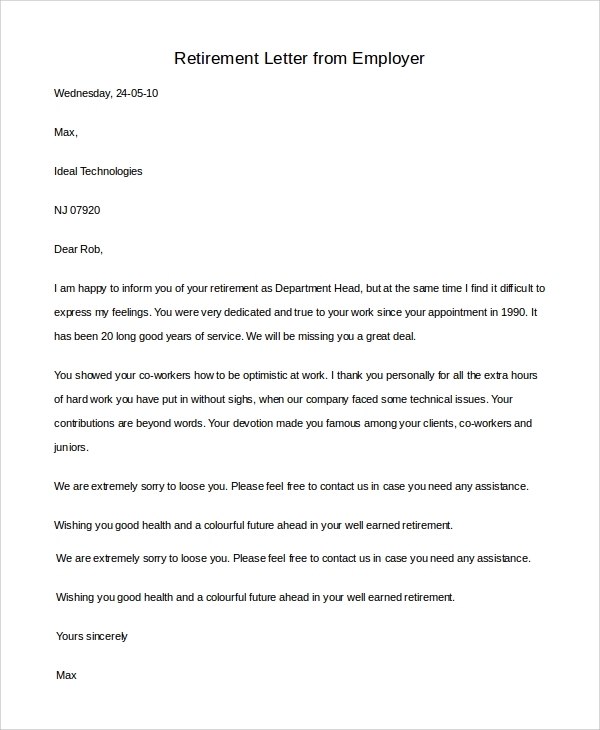 Examples of resignation letter also consist of retirement letters which are meant solely for the appreciation for the institute. 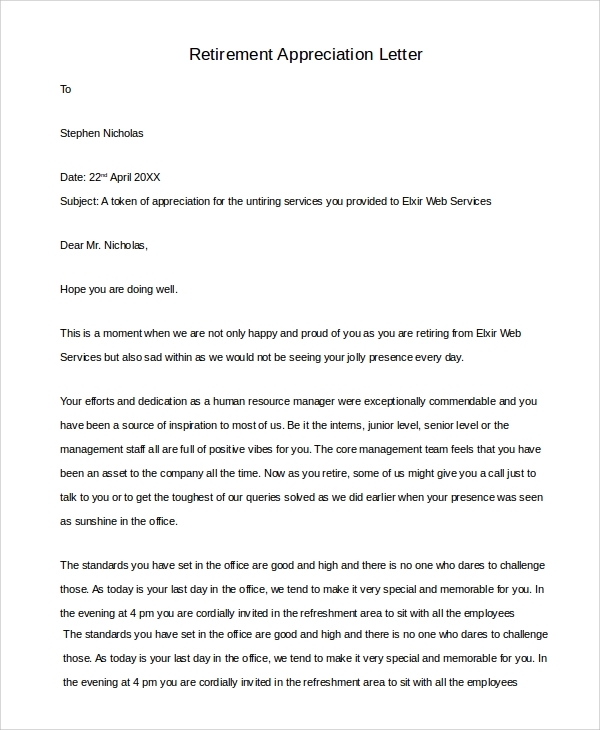 Such letters convey the deep regards and gratitude to the firm for providing a happy and contented work experience. What are the Benefits and Target Audience for these Letters? There are several benefits for the Sample Retirement Resignation Letters. They help you to express your pleasure and appreciation to the employer for providing a great work experience. 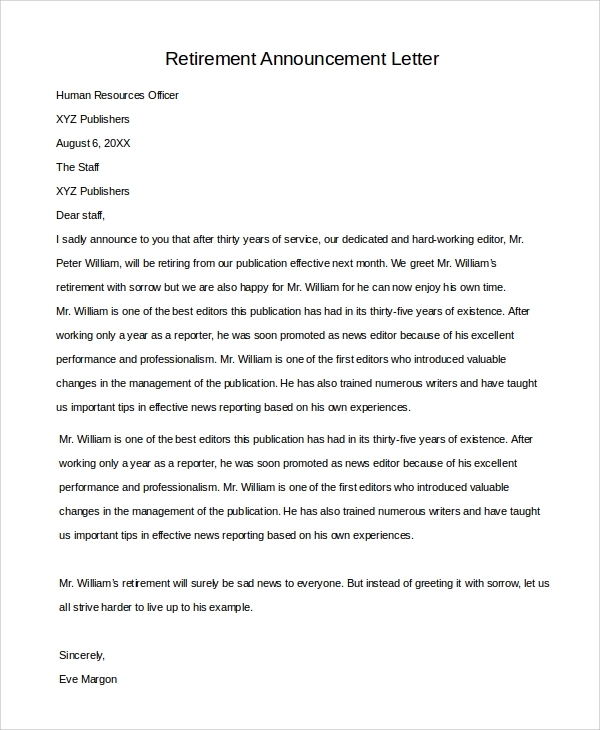 A sample retirement letter contains praises for the employer not as flattery but as real gratitude. These letters are also beneficial, most of all, for conveying the purpose of retirement to the employer. It can be hard to find the right words to speak about retirement to the higher authorities. Therefore, a written letter is helpful. There is no specific target audience for these letters since anyone can retire. But they are usually meant for people aged above 60 years for retiring from their jobs. The above – mentioned sample retirement letters contain the gist of all kinds of letters for the retirement announcement. 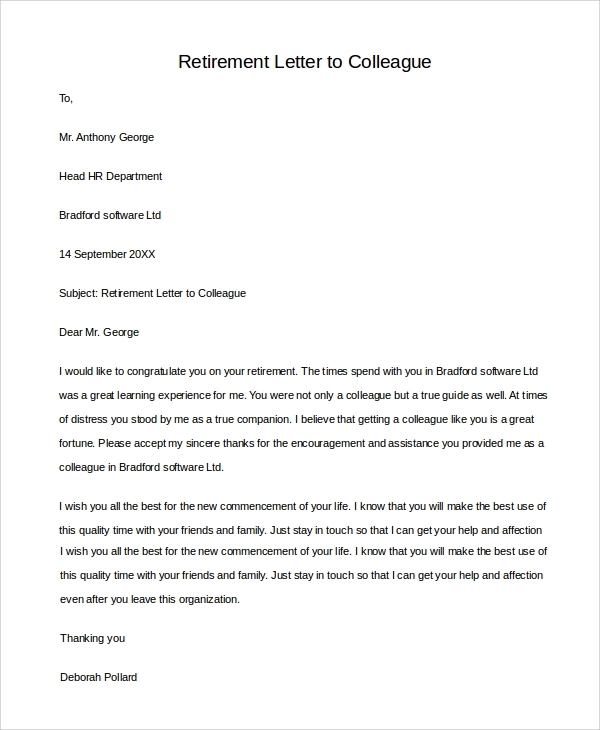 You can also refer to the Sample Retirement Resignation Letters which will help you understand the right arrangement for a resignation letter which conveys your retirement. These letters will assist you in drafting your retirement letter.